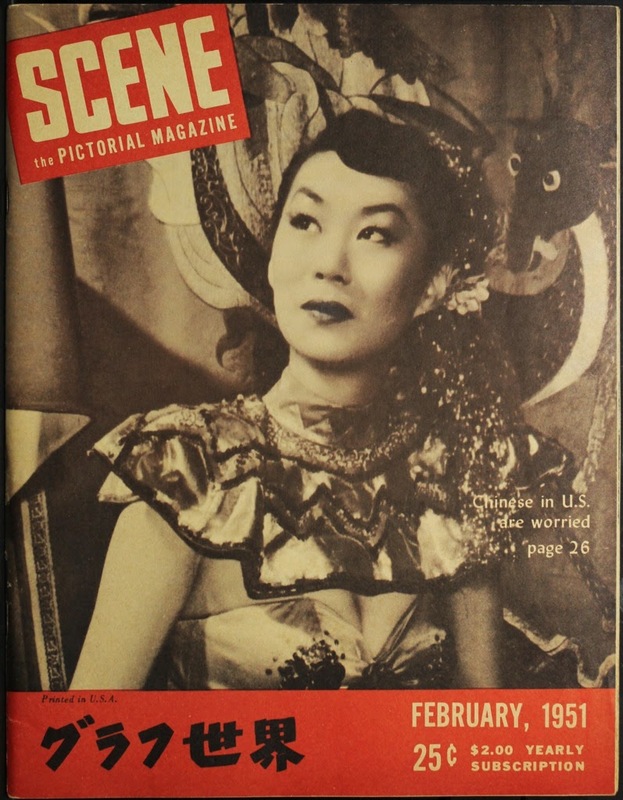 Nisei Vue and Scene were resettlement era Nisei pictorial magazines based in Chicago that reflected the hopes and dreams of at least a segment of the Nisei population in the years after World War II. In collaboration with the Japanese American National Museum, Densho is happy to make approximately seventy issues of these magazines available in digitized form. You can access the issues in our new Densho Digital Repository. Though both were large format pictorial magazines emanating from Chicago, they were actually separate and competing publications. Nisei Vue was the first to appear, its debut issue dated Spring 1948. About a year later, Scene debuted. If you didn't know they were separate magazines it would be easy to confuse them, since their look and contents were very similar. Both highlighted "successful" Nisei and ideal Nisei life, mixing in articles about Japan and Japanese culture. Both usually featured attractive Nisei women on the cover and neither was above the occasional cheesecake feature. For its first few years, Scene also included a Japanese language section. By all accounts, both lost money. Nisei Vue tried to go monthly starting in February 1949, but that proved to be short lived. It limped along for another year before folding in March 1950 after less than two years. Scene enjoyed a much longer run. Edited for most of it by Togo Tanaka a former English section editor of the Rafu Shimpo newspaper, Scene included contributions from many of the best known Nisei journalists and photographers including Bill Hosokawa, Louise Suski, Larry Tajiri, Carl Iwasaki, and Jack Iwata. No doubt searching for new audiences, it also underwent some fairly dramatic changes, at times bringing in content about Japanese Brazilians in Portuguese, transitioning to more of a pan-Asian focus, then dropping the Japanese language section entirely. In 1954, the magazine moved to Los Angeles after being sold to a Los Angeles based publisher and effectively shut down in the fall of 1955 after more than six years. For more on both, see the newly added encyclopedia articles on each. Undoubtedly due in part to the limited availability of the magazines, there has been limited published scholarship on them, only a brief treatment in Shirley Lim's Feeling of Belonging: Asian American Women's Popular Culture, 1930–1960 (New York: New York University Press, 2005). Despite that lack of ready availability, many other scholars have cited the magazines in their work on the early postwar years. We hope that making them available in our archive will inspire others to explore them. And if you can help us complete the collection, please let us know. We are missing some issues. The Scene collection is fairly complete with 67 of the 73 issues digitized. The only missing issues are the first three (May, June, and July 1949) as well as November 1950, December 1951, and June 1955. There are only two issues of Nisei Vue in the archive, just the Spring 1948 and Summer 1949 issues. Because of Nisei Vue's irregular publication schedule, it is hard to know exactly how many other issues there were, but we would be interested in any issues beyond those two. If you have missing issues to donate, please email [email protected]. There is much to recommend in their pages, and I'll be writing about various themes, ideas, and idiosyncrasies that can be found in them in the weeks to come. But for now, take a moment to browse a random issue to get a sense of what the idealized Nisei life looked like in the decade after leaving the concentration camps.